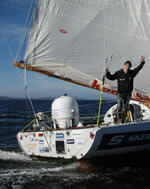 Born in March 1992, Michael Perham holds the Guinness World Record for the youngest person to sail across the Atlantic Ocean single-handed. He achieved this on January 3, 2007, at the age of fourteen, beating the previous record holder by over a year. Michael started sailing at the age of seven and has a love for anything that moves on water; he has completed a number of RYA (Royal Yachting Association) sailing courses in dinghy sailing and windsurfing and finished the RYA Yachtmaster syllabus before crossing the Atlantic (normally, students have to be at least eighteen-years-old before they can attempt the RYA Yachtmaster exam). Michael is a rare creature; an English teenage hero, modest, handsome, unassuming but charming and media savvy. Dangerous Seas for Boys has a fast, cinematic, live-action feel as the drama twists and turns from the open sea to the Perham’s front room. 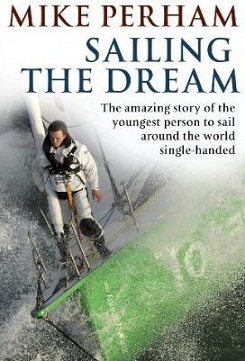 It discusses yachtsmanship with verve and passion, without ever turning into an anorak’s guide and is an absorbing true-life drama, which will appeal to anyone who has held a lifetime ambition. Cheerful, unstoppably positive, determined and embarrassingly modest, Michael has become an inspiration to many, and to young people in particular. Upon completion of his ambition, Michael plans to form the Sail Mike Foundation, which will allow young people the opportunity to take to the water and share some of his adventures. An original addition to the incredibly popular lone sailor genre, Dangerous Seas for Boys is sure to captivate and encourage readers to fulfil dreams of their own.